Every so often we have a customer contact us to say that no matter what they do their PRIIA makeup seems to ‘slide’ off within a few hours. The first questions we ask them are: “What skin care products are you using?” “What is your skin care routine?” “Which PRIIA minerale-derm products are you using?” We ask these questions because PRIIA’s formulas are made to adhere to the skin. We have thousands and thousands of customers who successfully use our products without incidence so we know that 9 times out of 10, makeup slide is due to ‘user error’. More than 99% of the time we find out that customers are using inappropriate products for their skin type and/or they’re layering one product after the other and not letting those skin care products absorb properly. When you’re using skin care products that are too ‘heavy’ for your skin type or you haven’t given the correct products a chance to fully absorb, your makeup can’t adhere properly. This goes for ANY makeup- not just PRIIA. Make sure you’re using skin type appropriate products. Heavy, oily-based skin care products don’t absorb properly and tend to just sit on the surface of the skin. Likewise, skin care products that are too harsh can adversely affect the skin barrier causing an over-production of sebum throughout the day. When using appropriate skin care products don’t use too much. Use only the recommended amount. Too much of a good thing isn’t good. You’re simply wasting product AND money. Before applying primer and/or foundation, wait AT LEAST 10-15 minutes for your moisturizer/SPF to fully absorb. Your skin should NOT feel wet or overly tacky. It should feel soft and mostly dry to the touch. While you’re waiting for your products to absorb go brush your teeth, get dressed, have breakfast, etc. 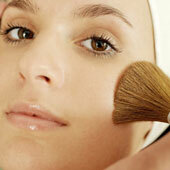 Once your skin care products have absorbed properly apply your makeup in light layers. Remember that you can always go back and add more but you can’t take away if you’ve applied too much to begin with. When using our acne-safe primer only use a pea-sized amount (about a half pump’s worth) for the entire face and use less around areas of the face with a lot of creasing (i.e. the sides of the nose). We’ve had customers tells us that their using a couple pump’s worth at one time! WOAH…don’t do that! Again, too much of a good thing isn’t good. If you’re an oily-skin gal, consider using our HydraPrime oil-control powder to ‘set’ your makeup and to help absorb oily breakthrough during the day. If you have combination skin, our BEHAVE Finishing Powder is a great product to help balance your complexion and complete your look. Give your complexion a refreshing hydrating boost during the day with our Hydrating Skin Spritz! It instantly delivers moisture while helping to lock down makeup. If you’ve tried the above suggestions and you’re still experiencing problems, consider making an appointment with a licensed skin care professional. They can examine your skin properly and assist you in choosing the correct products for your skin type and skin condition. This entry was posted in Expert Application Tips Revealed!, PRIIA Mineral Makeup and tagged acne, beauty, beauty tips, cosmetics, foundation, Hydraprime, makeup, mineral makeup, moisturizer, oily skin, PRIIA, primer, skin, skin type, SPF on August 23, 2017 by Kelley Maddison. Get pro beauty advice, sale notices, new product info & more!